UPDATE: a clarification has been added to the bottom regarding a matter of semantics concerning the app’s assumed approval process. Insiders told Michael Grothaus of The Guardian newspaper that the company is “not optimistic” that Apple will ever approve a native Google Maps iOS app, even though it should be ready to ship by year’s end. Apple previously advised dissatisfied customers to go download Google’s non-existent Maps app. One source, however, mentions “increased hopes” of Apple’s approval now that iOS boss Scott Forstall is gone. As you know, Forstall’s refusal to sign a public apology over the Maps debacle (CEO Tim Cook signed it) was reportedly the last straw which led to his undoing. Another source “was less than enthusiastic”, citing industry politics and Apple’s need to save face as much as possible and “keep moving forward in an effort to make its obviously inferior product better”. Google’s sources though do not think their own Maps app would be approved quickly. Specifically, they point to the lack of any mapping app in the “Find maps for your iPhone” section of the App Store – accessible only via iPhones or iPads – that use the Google Maps APIs to call wirelessly for location, routing or point-of-interest (POI) data. If it’s any consolation, both sources say Google and Apple keep communication lines so agreements “can change quickly”. Even if a Google Maps app is approved, sources tell iOS users should “never expect to see Google Maps back on the iPhone as its default mapping solution”. And Apple purposely leaving out of the apps that rely on a Google Maps backend from the new App Store section doesn’t bode well for the approval of an official Google Maps app. In other words, no matter how bad Apple’s Maps are, the company still wants its users to move on from Google – and forget about them. Another proof: the new iOS 6.1 Beta Apple released to developers last week includes some search-related improvements to its MapKit API suggesting the iPhone maker is serious about providing alternative solutions to Google-branded location, search and mapping services on the iPhone. This development will surely disappoint the more than 85 percent of respondents who voted for the native Google Maps iOS app in our little non-scientific poll. 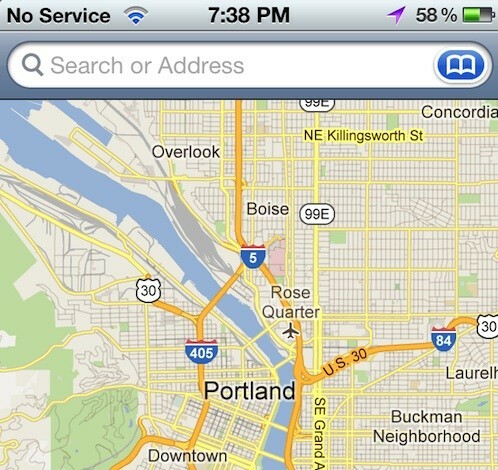 What do you think, will Apple ever approve a Google Maps iOS app? UPDATE: as some readers correctly pointed out in the comments, Google never actually submitted its own iOS Maps app though the company admitted to having the project in the pipeline. Sources told The Guardian in September that “Google is preparing a Google Maps app for iOS6”. This has prompted many writers to incorrectly assume that the search firm actually submitted the program to Apple for approval, fueled by Eric Schmidt’s ambiguous comment that any decision on whether Google Maps would be accepted as an application in the Apple App Store would have to be made by Apple. We haven’t done anything yet with Google Maps Apple would have to approve it. It’s their choice. The well-connected Jim Dalrymple also debunked the assumption with his trademark terse statement saying “Nope”. I even acknowledged the fact in my article dated September 25, but clearly forgot about it today and for that I am sorry. Thanks for everyone who have pointed out this semantic error in the comments. I hope this helps clear up the confusion.